The first map shows the London and Birmingham Railway, with an illustrated view of Euston Station at top right. The second shows the Grand Junction Railway (which connected Birmingham, Manchester and Liverpool) with an illustration of a train used on the line along the top. 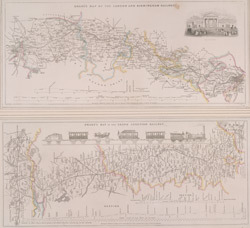 The titles of both maps appear above the relevant plans, with county boundaries outlined in colour. A level section of the railway line is given in a panel below each plan.